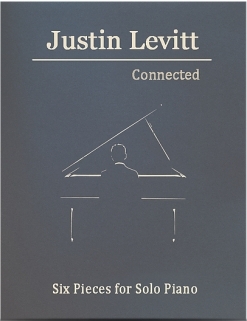 By My Side - Six Pieces for Solo Piano (Volume 2), Justin Levitt’s second collection of original piano solos is even better than his first! The accompanying CD features Levitt playing the pieces himself, demonstrating his intentions with the music. The book is beautifully laid out and notated on a creamy paper stock with crisp, sharp print that is well-spaced and easy to read. The book includes a bio and note from the composer, and notes on each of the pieces. The pieces themselves include alternate playing suggestions for pianists with smaller hands, metronome settings, pedaling (including half-pedaling), and detailed expression. The playing styles are varied and very expressive, making the pieces fun to play. None of the pieces are what I would consider simple, but they are not overly difficult, either. The six pieces range from the tender “Love for You” and “By My Side” to the wild and fun-filled “The Villain,” which includes the instruction to play “with shades on” complete with graphic! “Carnival” is a minor key waltz that sounds more than a little sinister for the first half, becoming more playful and innocent in the second. There are also two beautiful love songs - “By My Side” and “Love For You” - as well as the expansive “My Americana” and the tender “Goodbye for Now, but Not Forever.” These pieces will appeal to pianists of all ages and will provide hours and even years of piano-playing enjoyment. 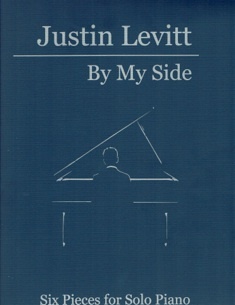 By My Side is available from www.JustinLevitt.com. Very highly recommended!